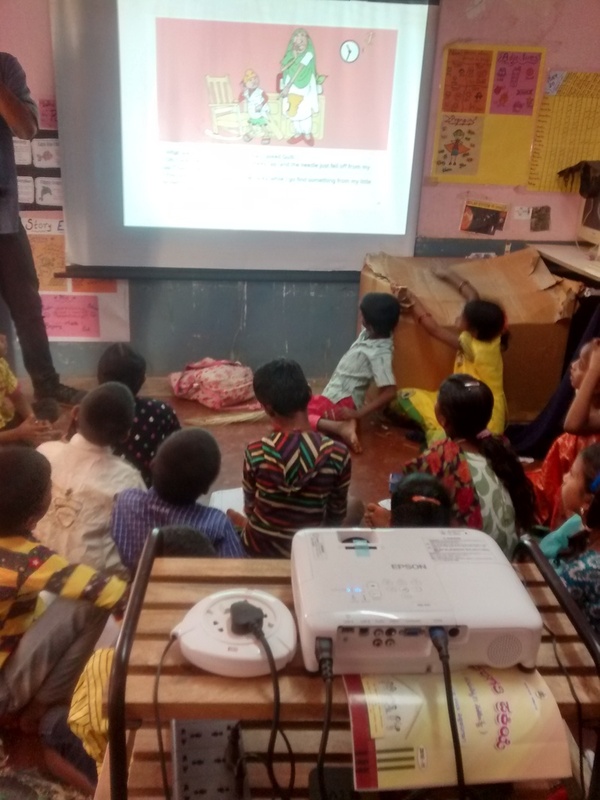 Payoshni Saraf, Outreach Manager, Digital Initiatives at Pratham Books shares what happened at a school visit to the Channasandra Government School, Bengaluru. Wednesday morning brought in considerable excitement. The StoryWeaver team was going into a classroom, albeit not to study or teach, but to see what a wonderful classroom is made of! As a part of a special project with Teach for India Bangalore, we are currently piloting the use of a curated collection of StoryWeaver titles in select Teach For India classrooms, here in namma city. The pilot is one of its kinds with a focus on using stories to enhance reading comprehension in the classroom resulting into an increase in reading fluency over the year. Armed with scribble pads and the palpable excitement of entering a classroom, we were welcomed in a 4th grade classroom in Government School, Channasandra at Kadugodi. First year Teach For India fellow Siddharth Chellappa was just starting the day with a morning meeting with his enthusiastic students discussing their visit to Cubbon Park the previous day. We soon moved into the first class for the day, which was the English Reading Comprehension class. The projector was connected, StoryWeaver was live and the children were set! ‘Gulli’s Box of Things’ was the day’s pick. The Level 2 book follows young Gulli and his seemingly bottomless box of things that always has just the thing needed to solve other people’s problems. Siddharth started the lesson by spending some time on the cover page. He asked the children to look at the illustration and listen to the name of the story and predict what the story could be about. The children were enthusiastic and vocal and had lots of suggestions. Maybe the story is about a box full of books....or what about Gulli’s box being a magical box? With all the conspiracy theories in place, the reading started. For each page that was read, Siddharth would pause and ask children questions around it. For example ‘How does Gulli’s Grandfather appear in this picture?’ Or ‘What do you think made the ‘Clink-clonk-dadum-dum’ sound?’ There were many giggles and laughs with every Clink-clonk-dadum-dum by the way! 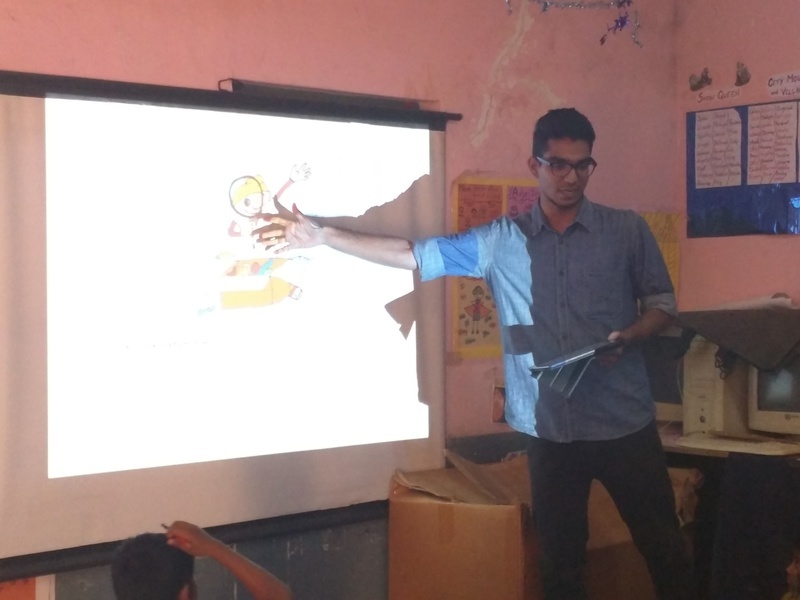 Another lovely moment was when Siddharth asked the children to try and relate aspects of the story to their own lives. He asked them if they knew anyone like Gulli in their homes or neighborhoods who helps without being asked and many children came up with examples of their fathers or friends helping strangers or people in need without an ask for it. ​Before we knew the story finished and we were left wanting more, as much as the children did. We wrapped up the visit with a quick interaction with the children and got to know about their favourite books…’Aaloo-Maloo-Kaloo’, ‘Rani’s First Day at School’ and The Giving Tree emerged as clear favorites. We said goodbye to the little munchkins and promised to see them again! 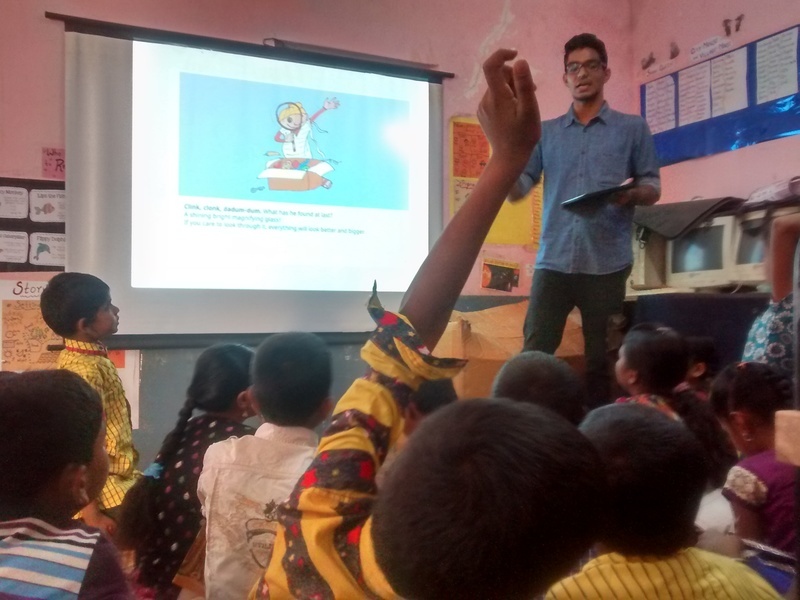 ​For the pilot we are currently in the midst of,​ Teach for India and StoryWeaver are aiming to harness the power of contextual stories and familiar settings to push reading comprehension among children, many of them first generation learners with English as their third or fourth language. The stories are being used for read alouds as well as independent readings with activities created around it to push understanding. "StoryWeaver is a great tool to use in the classroom, because it has so many possible applications. I'm able to create differentiated content ​from a story with such ease​ for all my children who are at different reading levels. Then, based on student interests I can also​ create amazing stories using StoryWeaver's ​collection​ of illustrations. Most importantly, having access to a massive story library​ with characters and stories​ the children can relate to, is the closest thing to a superpower a teacher who loves ​English and Reading Comprehension can have." We thank Teach for India for their support and enthusiasm, especially Teach for India Bangalore and Siddharth for letting us into their classroom​s.